Dimensions 0.25 by 8.75 by 11.25 in. Amazon.com description: Product Description: "I'm too fast, you're too slow. Pan, pan, patty-cake pan, I can get away from you, I can!" 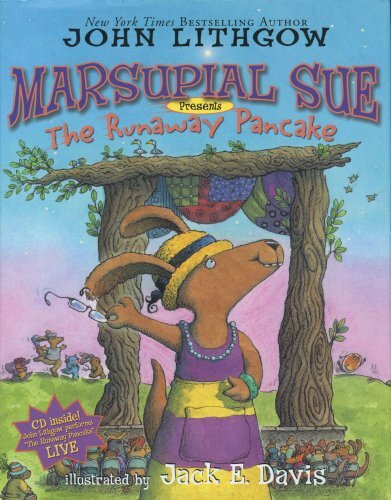 The much-loved story of the Runaway Pancake who pops out of the oven and is sure he can escape all who want to eat him, is given a new spin when Marsupial Sue and her friends put on a play version for their neighborhood. This has all of the wit and whimsy of Marsupial Sue and again features lively illustrations by Jack E. Davis. From the friends' preparations behind the scenes to the actors' final bows, readers will be inspired by the production. A CD recording of John Lithgow's live performance of the song "The Runaway Pancake" is also included. With Jack E. Davis (other contributor), John Lithgow | Reprint edition from Simon & Schuster (October 21, 2008); titled "Marsupial Sue Presents the Runaway Pancake"
About: “I'm too fast, you're too slow. About: Sue, a kangaroo, and some of her Australian animal friends put on a play called 'The Runaway Pancake. With Jack E. Davis (other contributor), John Lithgow | Reprint edition from Paw Prints (April 9, 2009); titled "Marsupial Sue Presents the Runaway Pancake"
About: âI'm too fast, you're too slow.